Brett Davis hasn’t experienced a lot of team success since he entered the Western Hockey League on a full-time basis in 2015. 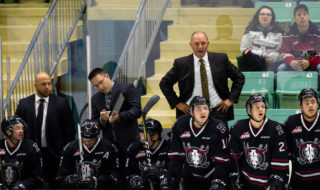 He’s hoping that is about to change now that he’s a member of the Red Deer Rebels. “Obviously I’m super stoked to come to Red Deer. I feel like it’s a winning environment here,” the 19-year-old said Monday, just three days after being acquired — along with fellow forward Cam Hausinger — from the Kootenay Ice. Davis was selected by Lethbridge in the 2014 WHL bantam draft and put up an impressive 27 points (21g,26a) in 42 games with the Manitoba midget AAA Eastman Selects as a 15-year-old in ’14-15 and also collected one helper in three games with the Hurricanes that season. He scored five goals and added four assists in 53 games the following winter and after sniping seven goals and garnering 11 points in 29 games with Lethbridge in 2016-17, he was dealt to the Ice part way through the season. With Kootenay, he amassed 11 goals and 22 points in 30 games and was selected by the Dallas Stars in the sixth round of the 2017 NHL entry draft. Davis enjoyed a breakthrough ’17-18 campaign, potting 25 goals and collecting 58 points in 72 games and this season had 19 points (7-12) in 24 games before being dealt to the Rebels. While he’s enjoyed some personal success, he’s appeared in only five playoff games — all with the Hurricanes in the spring of 2016 — during his time in the league. 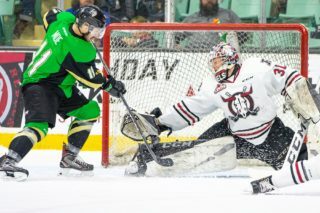 The Rebels have struggled somewhat of late but still hold down top spot in the Central Division and are coming off a 5-4 overtime loss Sunday in Lethbridge, where Davis, in his second game with his new team, scored twice and picked up an assist. “It was nice to get the first one as a Rebel, it kind of got a little stress off my back,” said the native of Oakbank, Man., who tallied twice in the third period, the second marker coming in the final minute and forcing overtime. Leaving his Kootenay teammates was difficult and because the team was already in Seattle when the deal went down, getting to Red Deer in time for a Saturday night engagement with the Moose Jaw Warriors was an adventure. 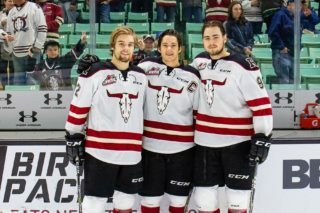 “Wherever you go you’re going to meet friends who are going to be your friends for life and coming in with Cam has made it a little easier to feel a little more comfortable here,” said Davis, who was also familiar with two of his new teammates — Jeff de Wit, who played with Davis in Kootenay, and fellow Dallas Stars draftee Dawson Barteaux. The six-foot-one, 178-pound winger arrived in Red Deer on Saturday just a few hours being the puck dropped. 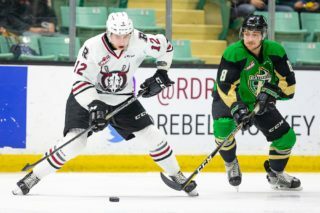 Now that he’s settled in with three points in his first two games with the Rebels, Davis is confident he can be a major contributor to the team through the remainder of the season. “I can be an offensive presence who can play in all situations. I can be a power play guy and I can kill penalties too,” he said. “I’ve always kind of liked killing penalties and when I get a chance I’ll try to take it to the net. Davis also provides a measure of maturity to the team, which features three overage players up front but only two 19-year-old forwards in himself and Hausinger. “I’ve been in the league for four years now so I like to see myself as a leader, helping out the young guys with things as much as possible,” said Davis. In the event that he has a killer last two-thirds of the season, Davis will quite possibly earn himself a pro contract with Dallas next year. The NHL team is definitely interested in the prospect considering he regularly talks to Stars player development coordinator Rich Peverley. For now, though, Davis is focused on helping the Rebels excel through the remainder of the regular season and the playoffs, where a lengthy run would be a first for the veteran. When Hausinger returns from injury this week, the Rebels will boast two lines that should score on a regular basis to go with an impressive blueline corps and strong goaltending. Yet, Davis is more impressed with another strength of the team. “The main thing is just seeing how tight the group is. It’s an awesome dressing room, the guys are all super close and I think that transitions onto the ice,” he said. Following Friday’s contest, the Rebels will host the Swift Current Broncos 24 hours later. 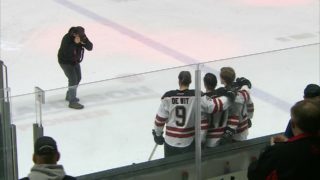 Red Deer will close out the pre-Christmas portion of their schedule next week with home-ice dates with the Kamloops Blazers and Medicine Hat Tigers Tuesday and Friday.